If you added up all the money of every billionaire in the world, you’d have about $8.9 trillion in wealth as of 2017. That represents the greatest total growth in wealth among billionaires ever. That’s according to a new report from UBS and PWC analyzing the uber wealthy. Where do these people live, how big are their fortunes, and what does it tell us about the global economy? Every bubble on our map represents a billionaire, and the size corresponds to the fortunes for every billionaire living in that country. And the size of each country represents the grand total wealth of every billionaire living there. And finally, we color-coded each region, giving you a quick visual snapshot of the world’s most elite individuals. The United States clearly dominates both in terms of the overall number of billionaires and the total value of their wealth. The US is home to several titans of technology, including household names like Jeff Bezos, Bill Gates and Larry Ellison. It’s important to remember that almost all of these luminaries hold their wealth in the stock market, usually tied directly to the company they founded. Mark Zuckerberg is so loaded that he lost $15 billion on a single day last summer. That’s a drop in the bucket when you compare it to the 585 billionaires in the US who control well over $3 trillion in wealth. Asia-Pacific is not far behind in challenging the United States as an engine for astonishing levels of wealth. 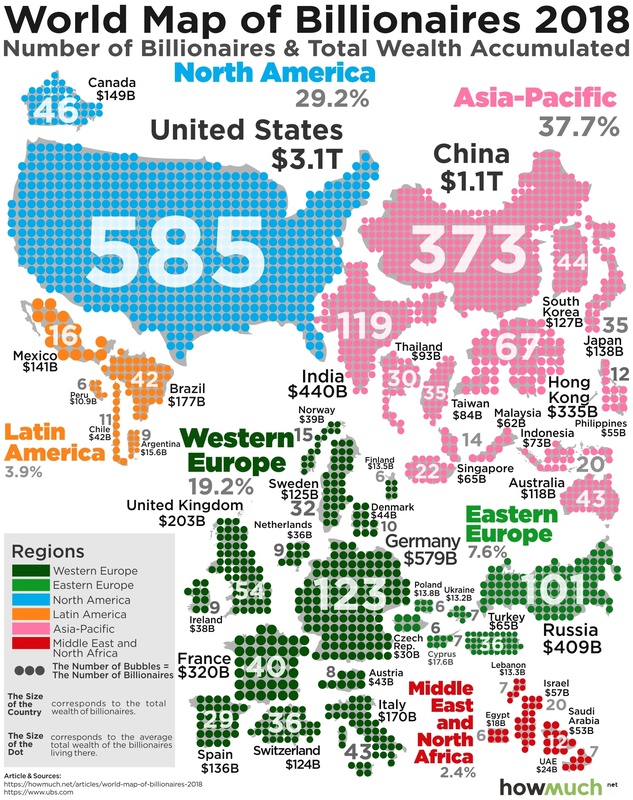 China alone accounts for 373 individuals boasting $1,120B in total value. Compare that to Japan, where according to the World Bank, the economy is about a third the size of China’s. But Japan has only about 10% as many billionaires (35 vs 373). Hong Kong’s billionaires have more total wealth than Japan’s despite its smaller size ($335B vs $138B). Western Europe is also home to lots of extremely wealthy billionaires, though not as many as Asia or North America. Germany leads the pack with 123 individuals controlling $579B, followed by France with 40 people owning $320B. 101 Russian billionaires meanwhile have a claim to $409B in wealth, though it’s worth pointing out that many Russian oligarchs made their money in highly questionable ways after the fall of the Soviet Union. That’s one of the reasons why Russia has one the most corrupt large economies in the world. And finally, one of the most interesting questions our map raises is why there aren’t more people in the billionaire club from the Middle East and North Africa. There’s certainly enough wealth in the oil industry to make at least several people fabulously wealthy, but perhaps part of the reason why we don’t see more people here is due to state-owned companies. Learn more about who the wealthiest people are in the world, where they live, and how they got their money.